Dedicated to all lovers of football and of major football events, the Self Tour of the Bernabéu Stadium guarantees to provide a unique experience with priority access and an audio-guide included. Visit the magnificent football stadium that is home to Real Madrid and access the pitch itself via the tunnel which is reserved for the players, visit the changing rooms and get a feel for the excitement that the players feel prior to the start of a match. But, above all, don't miss out on the opportunity to visit the museum inside the stadium! The history of some of the greatest footballers and of the most exciting matches awaits you with videos and plenty of detail on the audio-guide in English. Visit the club's museum and find out about the history of Real Madrid and about the finals that have been played here in this stadium. 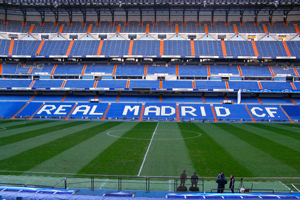 Bernabéu Stadium is one of the oldest and most prestigious football grounds in the world. Thanks to the focus of the independent tour that you can do, you will have the opportunity to enjoy this experience to the full from the first moment that you enter the ground as you will be able to benefit from priority access and won't have to waste any time in long and tedious queues at the entrance. Thanks to the audio-guide, you will be able to tour the whole building whilst listening to the wonderful commentary. Visit the Real Madrid changing rooms, the "sensations room," the presidential stand and get a sense of the emotion the players feel as they walk through the tunnel on to the pitch. In addition to all this, the club's fantastic museum is also waiting to welcome you with its wonderful videos which recount the Stadium's history as well as featuring some of its most illustrious players such as Di Stefano, Hugo Sánchez, Puskas, Butragueño, Beckham, Zidane, Casillas, Raúl, Guti, Ramos or Ronaldo and of course, not forgetting the truly memorable World Cup Final of 1982. Shortly after payment has been received, you will receive another email with the coupons attached that you can print off and show on the day of your visit.